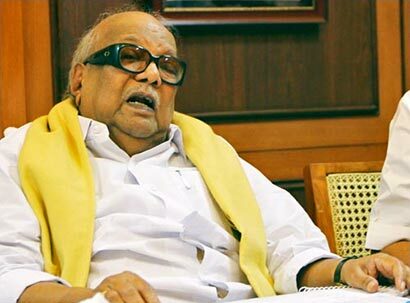 Describing as “an insult to injury” Sri Lankan President Mahinda Rajapaksa’s assertion that his country would not bow to outside pressure and withdraw the Army from the North, the Dravida Munnetra Kazhagam (DMK) president M. Karunanidhi on Sunday said the Tamil Eelam Supporters Organisation (TESO)would soon organise a conference to discuss these issues and take a decision. Recalling a report released by the US secretary of State Hillary Clinton that the major human rights problems were unlawful killings by security forces and government-allied paramilitary groups, often in predominantly Tamil areas, he said such reports further strengthened his argument in favour of a separate Tamil Eelam. you have to dream further,There was a man call VP,and you know what happen to him?and he was fighting for a tamil tigers terrorist state in Srilanka….and also killed your ex.prime minister Rajiv gahndi.so do not foget. first you try to withdraw army from north of your country and some other places in your country as well. then think about an internal problem of an another contry…hope fully its better to your age and experience to think about that.what ever..Mr.Karunanidhi Sri Lanka is an indepentant country and it should be ruled by a sri lankan only…at the same time its rules should be according to the requirement of our country people only, ratherthan to satisfy to another country politicians.. how ever we know you are playing a big game using our north people,to keep you political life for a long period…its only very clear think…please don’t cheet the innocent tamil people..